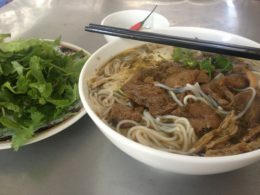 If it wasn’t for my friend Lucas over at Earth & Eats, I have to admit that Quy Nhon would not have been on my list of destinations when I was drafting my attempt to finally discover more of Vietnam outside of Saigon (Ho Chi Minh City). Such obvious destinations as Hanoi, Hoi An, and Halong Bay would have been in the running, but the little city of just under 300,000 nestled on the coast wouldn’t have even come up for debate had my friend not stopped there during his motorcycle journey across the country. Lucky for me, Lucas convinced me to go (the cheap flight there from Saigon helped too), and Quy Nhon turned out to be a great surprise. I would say it was the best place I visited, but that sort of goes without saying since I didn’t actually make it to anywhere else. More on that later though. 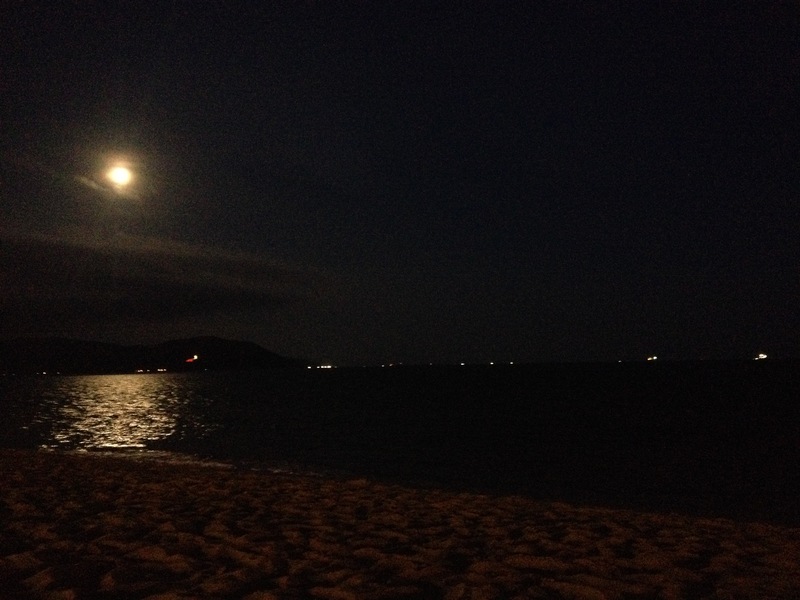 For now, let me introduce you to Quy Nhon, Vietnam! 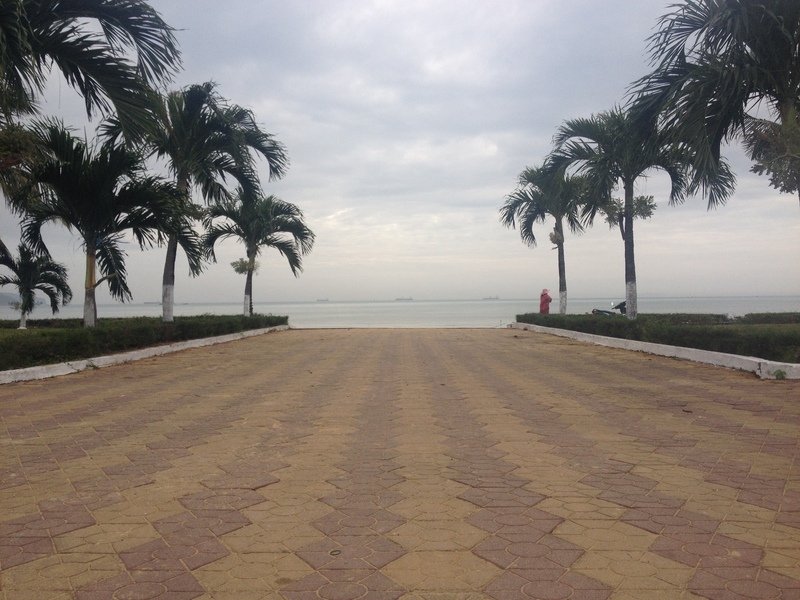 Admittedly, one of the major reasons why I wanted to explore more of Vietnam was to finally spend some time at a beach. After over a year in SE Asia, I had yet to really even dip my toes in the ocean. So, when I was faced with a month without a confirmed house sit, I knew that was something I had to fix. 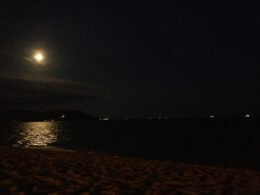 After seeing that Quy Nhon had a beach right within the city limits, and a few more surrounding it, I figured it wouldn’t be too hard to solve my problem once I arrived there. Unfortunately, after walking around the beach for a bit, I decided it might be best to not go swimming so close to the city centre and its busy port. So, I settled with simply walking along the edge with my feet in the waves. As someone who grew up swimming in fresh water, doing that was honestly enough to scratch the itch. There’s too many weird creatures and other things in the ocean anyway! 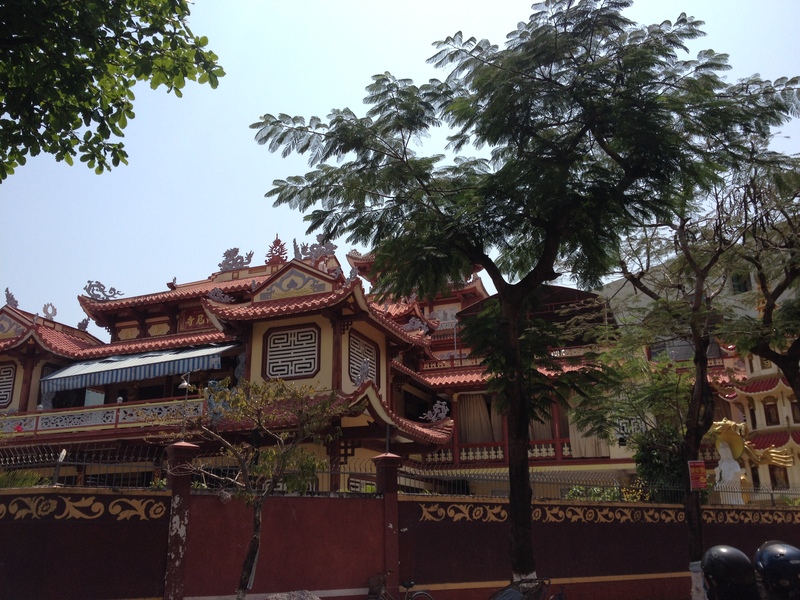 Plus, there was more to see in Quy Nhon than just the beach. Although I didn’t rent a scooter, I did meet a number of tourists in the hostel I stayed at that took trips to other beaches and sites just outside of the city, and they all returned with positive reviews. Along with those spots, I also visited a number of temples within the city that were all interesting, and at least one turned out to be a rather large complex of buildings and gardens. Since I’m not much of a tourist myself, I’m sure I didn’t cover all the sights during the month or so that I was in the city, but you can find other recommendations here, if you’re interested. Oh, did I mention that movies at the local cinema were wonderfully cheap? Although Black Panther would be worth seeing at even the usual price back home in Canada, being able to see it for about $5CDN was just another great thing about Quy Nhon. 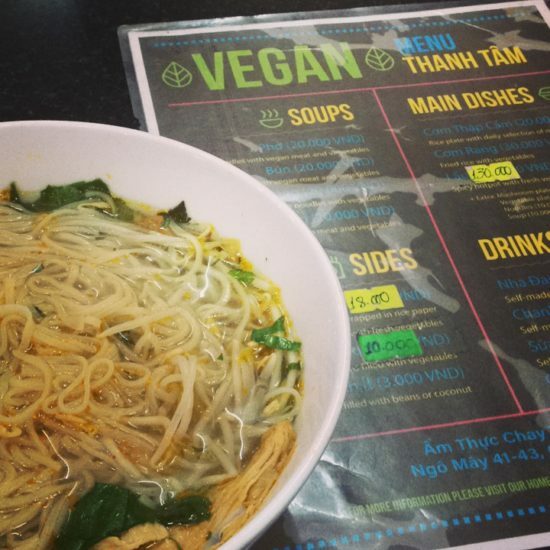 Although I’m sure you’re here mainly to read about the vegan options in Quy Nhon, I just can’t do a post about the city without mentioning the people. Lucas had told me they were really friendly when he first suggested the place, but I was still surprised at just how much that was true. Before I even landed in Quy Nhon, a young family I sat next to on the plane had offered to split a cab with me into the city (and they then refused to take money for my part of the fare), and they also suggested the use of their scooter to explore their hometown. As if that wasn’t enough, a couple days after I had settled in to my hostel, they messaged me on Facebook to see if I was doing okay. This friendliness extended beyond just that family, and continued to be shown in the people I would pass on the street who would say “Hello!” when they could (English wasn’t very common, which was great in my books, but could certainly be a negative for some folks!) or even ask me questions about where I was from, what I thought of Vietnam, etc. Along with this curiosity, I constantly noticed people staring at me, but not in a bad way. 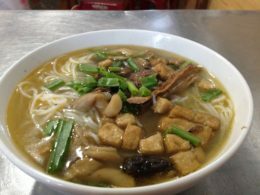 Even though I walked the same route to a few restaurants almost every day, I still stuck out like a sore thumb in a city that was very much Vietnamese. Thankfully, one place where I started to fit-in was the hostel I was staying in, and when I ended up sick for 2-3 weeks, this was very much a good thing. Days after arriving there, I was invited to join the owner’s family for dinner, and the hospitality continued until the day I checked-out. The owner, who I am still in touch with, even took me to the doctor and acted as my translator after we both decided I needed to go. During that time, the rest of her family were also involved in making sure I ate, stayed hydrated, and was generally doing okay. 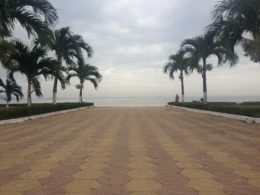 When you add to this the fact that the business itself was practically brand new, and the location was great, I think it’s obvious why I would recommend a stay at Hotel Trần Anh. Between the city itself and the people within it, Quy Nhon would be an interesting destination on those merits alone. However, thanks to just how easy it is to be veg in Vietnam, this small city also had plenty to offer when it came time to eat. 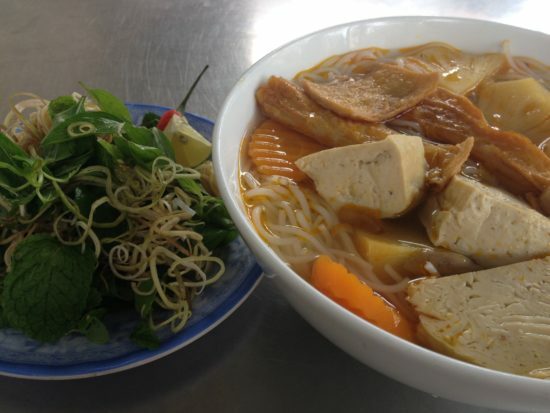 Although I’ve already raved on and on about how great the vegan options are in Vietnam, it’s true that my experiences up until my time in Quy Nhon had been solely in Saigon. That being said, after a month in the much smaller city on the coast, I think I can safely say that Vietnam is a great place to be vegan. Even though I didn’t get a chance to cook since I was staying in a hostel, I did notice at least a few familiar items in the grocery store that would have allowed me to eat well enough at home. Granted, the selection wasn’t as good as having access to a vegan grocery store, but how many cities in the world can offer that sort of service anyway? As for restaurants, a search on HappyCow provided me with over a dozen options while I was there, and I believe I tried at least half of them. As usual, I stuck with the cheaper spots to try and maintain a strict budget, and I was pleasantly surprised to find that prices in Quy Nhon were even better than those in Saigon. Needless to say, it made it difficult to go back to the higher prices of cities like Bangkok and Kuala Lumpur, but at the time I sure wasn’t going to complain about getting a meal for a little over $1CDN! That being said, if you go to Quy Nhon expecting much of anything outside of basic Vietnamese food, you may wind-up disappointed. I did notice at least one sushi restaurant while out exploring, but that was about it. Personally, I could do noodles and veg and rice for a long time (maybe not so much while I’m sick), so I didn’t have an issue with simple menus and local dishes. 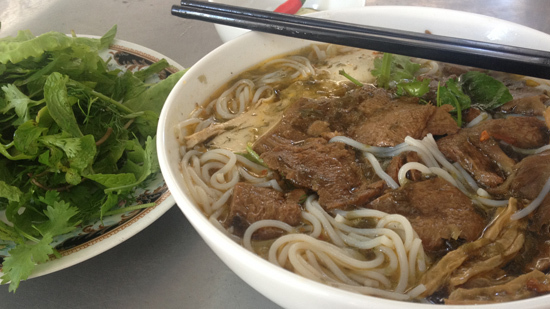 After all, what’s the fun in going to Vietnam if you’re not going to eat banh mi, Bún bò Huế, and pho all the time? Vegan versions, of course. Over the month or so that I was in Quy Nhon, I probably spent most of my time eating here. The menu was a little more to my liking compared to Am Thuc Chay Thanh Tam, but the biggest attraction for me was the friendly staff. One person in particular knew a bit of English, and he would always talk with me whenever he was working. Along with the humans there, I also had the pleasure of having a cat hang out with me a couple of times, which is always nice in my books. On another note, for those who are familiar with the Loving Hut chain, you’ll notice a familiar face in many of the programs they watch on the TV in the back, but luckily the propaganda isn’t as blatant as the LH restaurants usually are. With an English menu (not always provided, but you can probably ask for it) that highlights the restaurant being vegan, a number of interesting fake meat options on a table separate from the buffet (and with an additional charge), and steamed buns and little ginger muffins on occasion, it’s easy to see why this place is popular. In fact, there’s even a second location near the cinema and large temple complex I mentioned previously. Personally, I didn’t find the food to be anything better than other options available, so the extra price for some things didn’t seem warranted. That being said, they are open later than the other spots I visited frequently (see the video below for a note on Quy Nhon’s early business hours), so you may find yourself here more than once if you’re looking for food beyond 7 or 8PM. This place seemed to have the earliest hours out of all the spots in my neighbourhood, minus perhaps the banh mi guy (located close to this location) who was basically out of buns before 9AM. Their prices are a little higher, but the food was generally fresh and tasty. It’s possible that there were options available, but thanks to the language barrier, I would typically just show up, smile, and nod before I was served a noodle dish with some fresh herbs and leafy greens on a plate. Speaking of early hours, I actually almost missed this place entirely thanks to trying to eat there a day or two after I arrived and finding it closed. 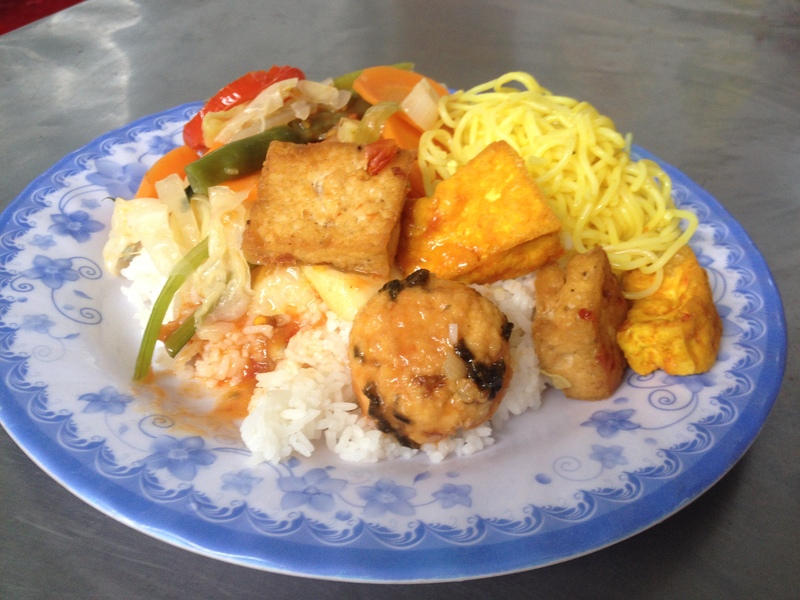 Thanks to that, I settled into eating mainly at Cho Thue Phong Tro and Am Thuc Chay Thanh Tam, and, if it wasn’t for me getting sick and losing interest in continuing to eat the same dishes at those places, I might not have tried going back. Luckily, I did. 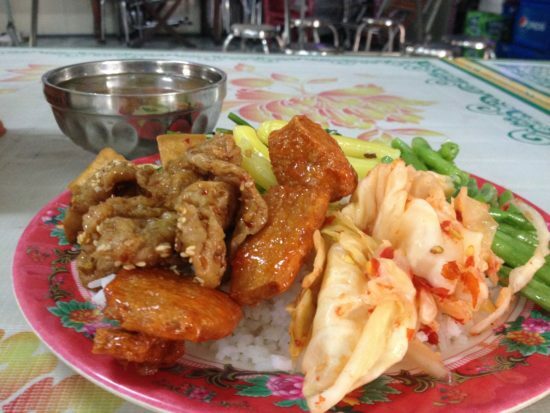 Even though the sight of kimchi in their tiny buffet would have been enough to win me over, the fact that they let you fill your plate instead of doing it for you was a nice change from the other spots. The staff were rather friendly, and the price was similar to the other spots, so it became my go-to during the last week or so that I was there. 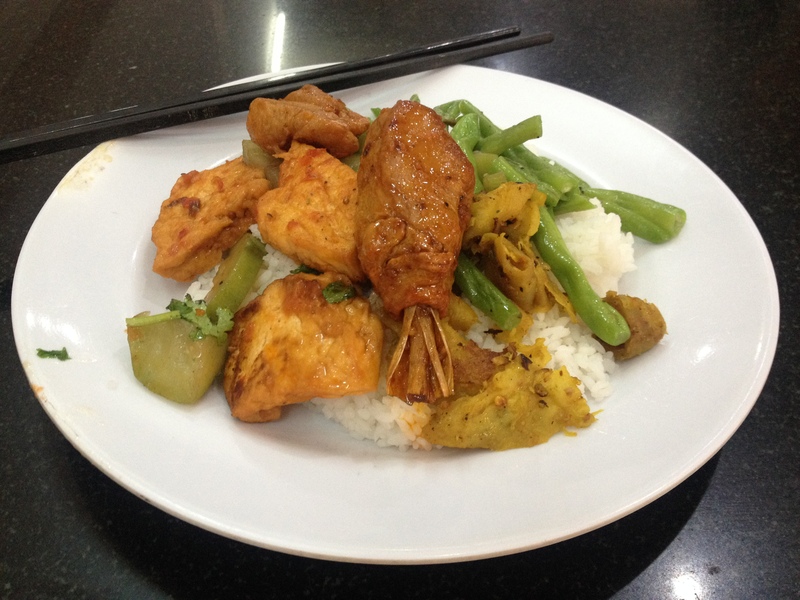 I even made sure to drop in before I hopped on the train so I could have something to eat for the long trip back to Saigon! 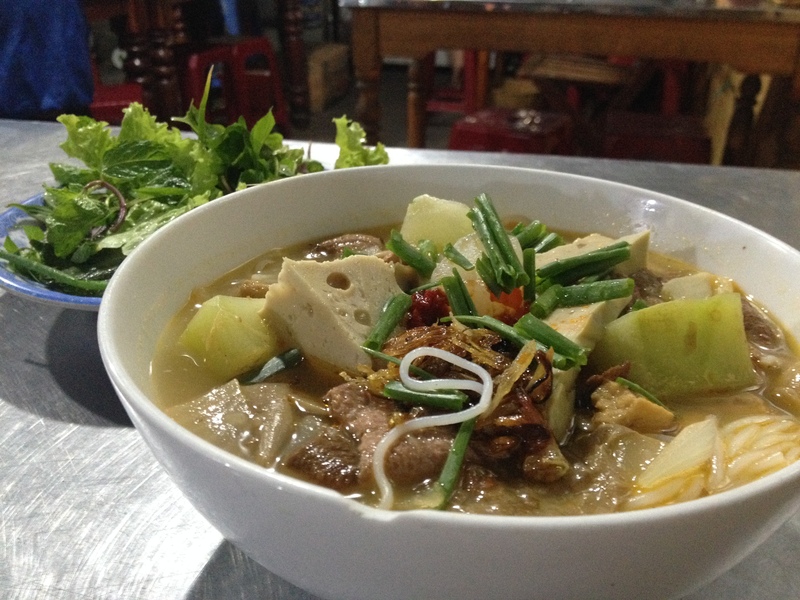 As I mentioned, I did visit a few other places in Quy Nhon, including the second Am Thuc Chay Thanh Tam location. However, none of them really impressed me enough to warrant multiple visits unless I was in the area to see a movie. That being said, all the options in the city were good given the price and the population. Sure, you won’t find smoothie bowls, raw dishes, or a high focus on organic produce, but you will certainly not go hungry! Personally, if I can leave the beaten path and avoid a high concentration of tourists without also losing access to vegan options, that’s a win-win in my books! For a little bit more on the city, its vegan options, and the early business hours, check out the video.